Only one week left for nut tree sale! Hardy, disease resistant nut trees from Mark Shepard - on sale until January 31. This past week I've been busy updating the website with all the new fruit trees and shrubs we'll be offering this spring. So - an exciting link follows below for those who are into everything from berries to kiwis. In other words, you don’t have to buy 100 bulk trees, you can mix and match. If you are planning to buy 100 bulk trees, that will get you the deal, but you could also buy 75 trees, and various other single trees, herbs, and vines. Maybe you could use some hardy kiwis or pawpaws to flesh out your food forest? Don’t forget - the coupon code is gonutz. Enter it at check-out, and if you have at least $1000 worth of goodness in your cart, you'll see the price reduction in the cart. Next up - more information about how much money you can make from nut trees, which I've pasted in from last year with only light editing. And down at the very bottom: a link to the web shop that has all the new and featured items. How much $$$ can you make with chestnuts and hazelnuts? Now into some detail about economic reasons to plant chestnuts and hazelnuts. Personally, my own reasons for planting tree crops are multiple. I want the best, most nutrient dense, and pesticide-free food for my family. I want to change land from annual tillage to perennial crops that don’t have to be planted every year so we can keep nutrients in the ground - instead of flowing down the creek or into the atmosphere. I want to build organic matter, and promote soils that behave well with both drought and seasonal flood conditions. But there is also the economic reality of making money for my family to buy things I can’t or don’t wish to grow or make myself. So, without further ado, here are some numbers I figured out that should give you an idea of how lucrative nut crops can be. If your field is certified organic, or you took the nuts to a higher paying centre like Toronto, you could be looking at an even higher profit. If you want to get into peeling them yourself, you can get prices like $21.25/lb - a price I saw on Amazon.ca. Chestnuts will be reliably baring around year 7, but you can get lighter crops by year 3-4 in some cases. I’ll send more information in a future newsletter on how to care for them while you’re waiting (hint - not too labour intensive). 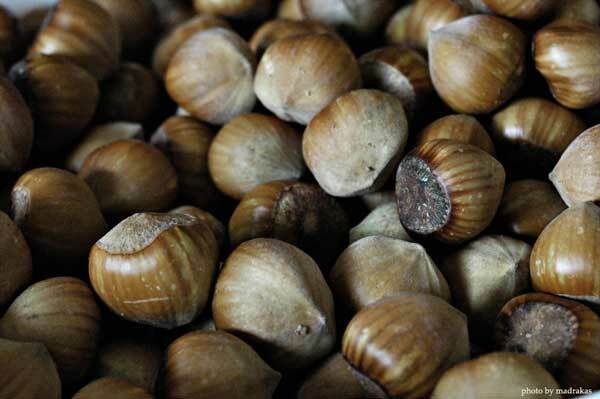 Before moving on to hazelnuts, I’ll also mention that the example above that had chestnuts for $5/lb raw in-shell was harvested by hand-picking from the ground. They were making that work, and I've done that before for black walnuts. Other ways to harvest include hand nut-rollers, and nut-roller attachments for lawn tractors. With a hand nut-roller, you don’t have to worry about what you plant under the tree - I’ll be putting in berries, herbs and more. With the lawn tractor method, you drive around under the tree when most of the nuts have fallen, and gather them all that way - so it’s most suited to if you’re going to have grass under the trees. That said, if you timed it right, and your herbs and berries were done for the season before the chestnuts had dropped, you could mow back everything with a lawnmower first, then use a nut-roller after that. I looked up the price of hazelnuts on amazon.ca, and found them for $10/lb in shell. At a low-end estimate of 2lbs of nuts per tree, that’s $20 per bush per year, and that starts sooner than chestnuts, likely around year 3 or 5. Hazelnut bushes also take up less space than chestnuts (about 8’x8’, but can be less or more depending on how you prune them), and are easier to propagate from cuttings. Every year you can be separating off suckers from the base, layering branches, and taking cuttings and putting them in the soil, or in soilless mediums, and multiplying your future trees. By the way - harvest with hazels is either by hand picking off the bushes, or with straddle harvesters. There are not too many people using straddle harvesters in Ontario currently, but if you design your plantings for using them some day, maybe you could go in with some local friends to buy one? They can be modified to do blueberries and saskatoon berries too. By the way - there’s also this more rare chestnut based sweet called puree de marron - look that up. It sounds amazing. I ended up using an ancient ad for the stuff for our chestnut creature ('Nutty Buddy') image now appearing on our homepage. Sold yet? There will be one last reminder coming up, but don't wait for that…last year we completely sold out of almost all our fruit trees and bulk nut trees. Oh yeah - and we also have listed all our other new items for Spring 2018 - so you can have a peak at those, and pre-order those as well. They count towards the $1000 sale! There are a few plants in there we have never offered before, and some new varieties of perennial favourites.